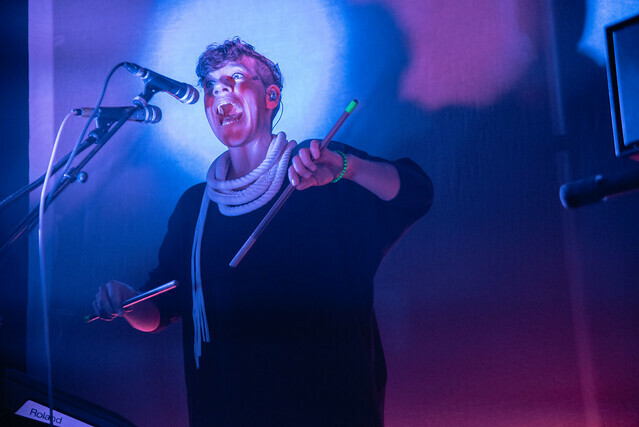 Merrill Garbus is doing some innovative work with tUnE-yArDs. As the saying goes, if you don’t know, now you know. The hour plus we stood in attention flew by, a sign of a solid show. Much of the crowd seemed to be pretty big fans, singing along and some even donning Merrill-esque face paint. Everyone walked away feeling good about what they just experienced. The pop-synth percussion and her naturalistic, androgynous voice create something entirely unique to the music scene right now. It’s almost an electronic tribal theme which is a strange juxtaposition that works. The live performance of this inventive sound is even more impressive. It is intense visually and audibly experiencing the creation of these textured sounds. Garbus is responsible for a great deal of this, with only a bassist and drummer accompanying her. Compared to the first time we saw tUnE-yArDs at Headliners, a lot more of the performance was on Merrill’s shoulders. Though the recorded project is fun and catchy to say the least, the live rendition of these tracks take the music to new places each time. I certainly like this form more.